Watercress is an aquatic plant with succulent leaves. It is native to Europe and Asia and is among one of the oldest known leaf vegetables consumed by humans. Traditional English tea sandwiches usually have watercress, and in Britain watercress was often referred to as “poor man’s bread.” It was inexpensive to eat plain watercress between two pieces of bread. However, “Father of Medicine” Hippocrates saw the value in this peppery-flavored green. He reportedly established his first hospital beside a stream, so he could grow watercress to treat his patients. He may have been onto something, because watercress contains many essential vitamins and minerals and may do wonders for your health. Watercress may reduce DNA damage, which may lead to cancer. The American Journal of Clinical Nutrition published a study that shows watercress may reduce lymphocyte (type of white blood cell) DNA damage, especially in smokers. The study examined 30 men and 30 women (30 smokers and 30 non-smokers). Subjects were given 85 grams of raw watercress for 8 weeks while still maintaining their habitual diets. Researchers saw a reduction of lymphocyte DNA damage by more than 20 percent, and they saw a greater reduction in the group of smokers. “The results support the theory that consumption of watercress can be linked to a reduced risk of cancer via decreased damage to DNA and possible modulation of antioxidant status by increasing carotenoid concentrations,” the study reports. If you smoke and won’t kick the habit, you really may want to consider eating more watercress. A study conducted by the University of Pittsburgh found that watercress extract may detoxify carcinogens in smokers. The study examined 82 cigarette smokers. Some of the smokers were given 10 milligrams of watercress extract mixed with 1 milliliter of olive oil for four times a day. The remaining smokers were just given a placebo. All smokers continued their regular smoking habits throughout the trial. “Participants who lacked two genes involved in a genetic pathway that helps the antioxidant glutathione remove carcinogens and toxicants from the body saw an even bigger benefit to taking the watercress extract, which increased their detoxification of benzene by 95.4 percent, acrolein by 32.7 percent and crotonaldehyde by 29.8 percent,” the study reports. 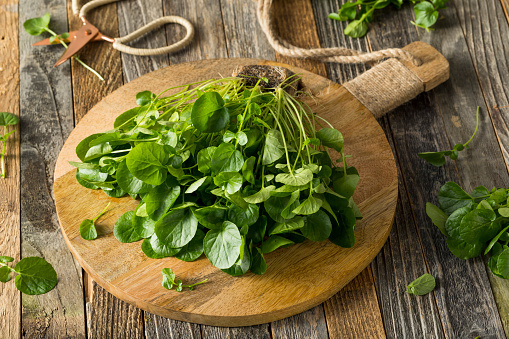 Watercress may help reduce your risk for Alzheimer’s and cardiovascular disease. Several sources, including the National Institutes for Health (NIH), support that vitamin K may reduce the risk of Alzheimer’s and cardiovascular disease. This vitamin helps form and strengthen the bones and limits neuronal damage in the brain, which is helpful in treating Alzheimer's disease. Vitamin K is by far the most prominent nutrient in watercress, with more than 100% of the daily recommended value. There are many more reasons why you may want to incorporate this delicate, leafy green into your daily diet. Calcium, 41 mg. You probably know that this mineral is essential for strong, healthy bones and teeth. Did you know this mineral may also decrease your risk for colorectal cancer? Recent studies confirm that high calcium intake is associated with a lower risk of colorectal cancer among both men and women. Maintaining the correct levels of calcium in your system could also reduce your risk of breast cancer as well. Magnesium, 7 mg. Magnesium helps with blood pressure regulation and also has antioxidant properties. Several studies have also shown an improvement in the severity of symptoms of depression when study participants were given 125-300 mg of magnesium with each meal and at bedtime. Phosphorus, 20 mg. This mineral works with calcium to build strong bones and teeth. It is also needed to help balance and use other vitamins and minerals, including vitamin D, iodine, magnesium and zinc. Potassium, 112 mg. There’s a surprising connection with the liver and potassium. Liver injury or infection causes patients to urinate their potassium out. When the liver heals, the potassium levels start to go back up. This has implications for people with chronic liver problems, in terms of both diet as well as use of medications, since very low potassium levels can be more dangerous than the liver problem alone. Potassium may also help keep blood pressure under control and may even help reduce kidney stones and bone loss as you age. Sodium, 14 mg. Sodium is something we’re often told to avoid, but in reality sodium helps to engineer the actions of every human cell. Every human action including eating, thinking, running and working depends on adequate sodium. Just be careful and talk to your doctor about your particular sodium needs. Avoid processed foods, which usually contain way more sodium than any of us need. Watercress is a healthier, more natural way to get sodium. And with its delicious, peppery flavor, you may find yourself putting the salt shaker down. Vitamin C, 14.6 mg. Vitamin C boosts the immune system, and this vitamin’s antioxidant properties help keep skin and hair appear healthier and more youthful. Vitamin C helps the body form and maintain connective tissue, including bones, blood vessels and skin (which is why it is often referred to as a beauty vitamin). If you are about to have surgery, you may want to get more Vitamin C. Find out why, here. Vitamin A, 54 mcg. Vitamin A helps protect the surface of the eye (cornea) and is also essential for good vision. Vitamin A is also known as retinol. You may have seen retinol in face cleansers and moisturizers because it improves the skin’s elasticity and helps reduce the appearance of wrinkles. Watercress is very nutritious and is a vegetable I have never tried. My goal is to find it and incorporate it into my diet. Sometimes we get too busy to chop up fruits and veggies. But it appears I can easily throw watercress in a pineapple and green smoothie or sprinkle some over soup. When I have more time in the kitchen, I plan to try this watercress and mint salad. It’s so inspiring to know there are foods out there that may help prevent some of the most life-threatening diseases. Healthy food is some of the best medicine. What are some of your favorite recipes with watercress?